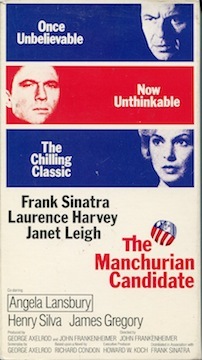 The Manchurian Candidate with Frank Sinatra and Angela Lansbury is possibly the most chilling movie I have ever seen. Also starring Laurence Harvey and Janet Leigh, this film is a political thriller set during the Korean War. It’s about the son of a prominent American political family who has been brainwashed into being an assassin for the Communist party. This is one of those films that sticks with you, no matter how long it’s been since you’ve seen it. Frank Sinatra at his finest. Buy this video, or any of my other videos, on eBay and get free shipping for a limited time!